With over thirty years of experience serving the life science industry, we have an advanced material, adhesive and converting knowledge base. This, in addition to our friendly one-on-one service, gives Diversified Biotech a unique advantage to help you reach your production an sample tracking goals. 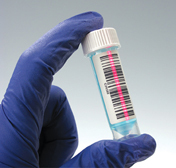 Diversified Biotech has a wide variety of materials available to suit your specific labeling and storage needs. Our proven labels systems provide superior sample integrity and traceability. These solutions are available for use with any standard laser printer, thermal transfer printer or direct thermal printer. Whether you need an off-the-shelf solution or a fully customized one, we can help! When you consider material choices, label sizes/shapes, printing methods, printing formats and branding requirements, the possibilities are endless! We can deliver the exact label you need for your application. Our customization capabilities range form simple sizing requirements to complex, load-and-apply solutions. Many factors need to be considered when choosing and printing a barcode for sample tracking. 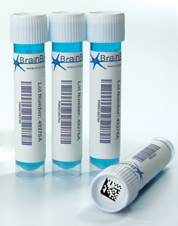 From simple in-lab sample tracking for freezer storage, to advanced sample preparation for bio-banking applications, we can provide the best label with the highest quality barcodes for your needs. Sharp, easy to scan linear and 2D barcodes with crisp human readable information can easily be pre-printed on your choice of label stock to ensure that all samples can be recorded and easily tracked during the duration of their storage.